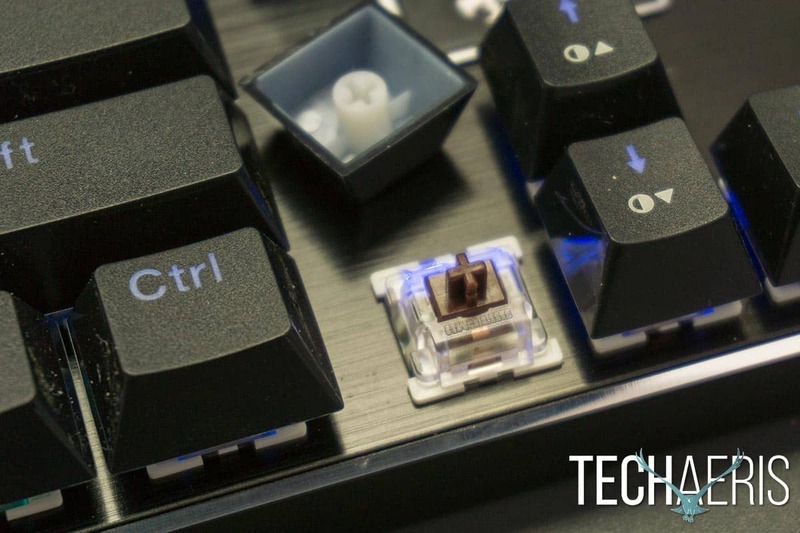 When it comes to mechanical gaming keyboards, there are a few top brands that come to mind. Of course, that’s not to say there aren’t comparable and more affordable mechanical gaming keyboards for those on a budget. 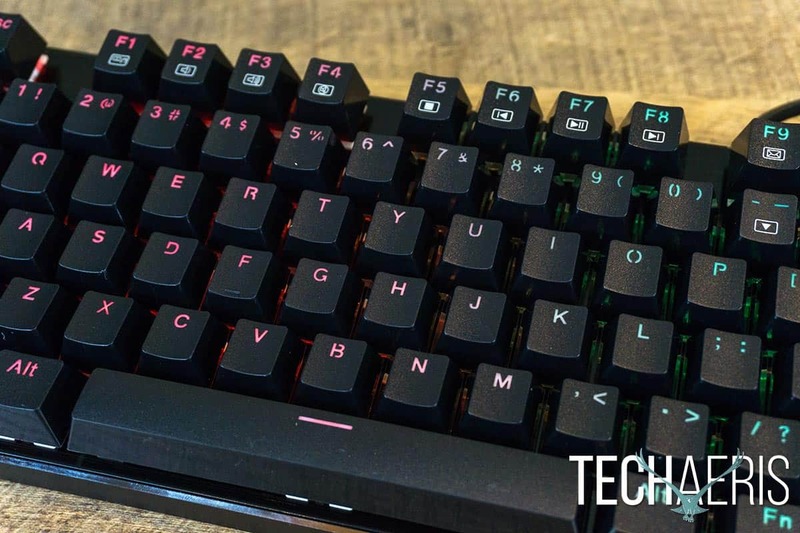 Our Redragon K556 review takes a look at an RGB backlit mechanical gaming keyboard with brown switches and macro functionality that doesn’t break the bank. Outemu Mechanical Brown Switches: Offering the best tactile typing experience, also being ever so slightly quieter, fitting for office or gaming use. And you will get 8 spared switches as a gift. 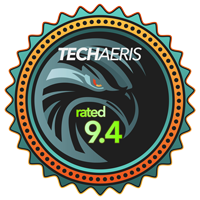 I’ve reviewed quite a few keyboards here at Techaeris ranging in quality and price. Given the price point, I was impressed with the build quality of the Redragon K556 Mechanical Gaming Keyboard. The Redragon K556 RGB Mechanical Gaming Keyboard. At 1.3lbs, it has a nice weight to it due to the main aluminum frame component. The surface is a brushed black finish with chamfered silver edges to give it an industrial look. All four sides also have a black finish with the left and right sides containing three screws as well. Removing these screws allow the sides to be removed, presumably for accessing the mainboard once you’ve removed all the keycaps and switches. The USB cable is attached to the center of the back of the keyboard and has your typical plastic sheathing finish. Side view of the Redragon K556. They keys themselves are of the floating keyboard design and sit slightly above the main face of the keyboard. Being your standard 104-key layout, you have your familiar six-row layout with full number pad, arrow keys, and home/del/etc in the usual locations. 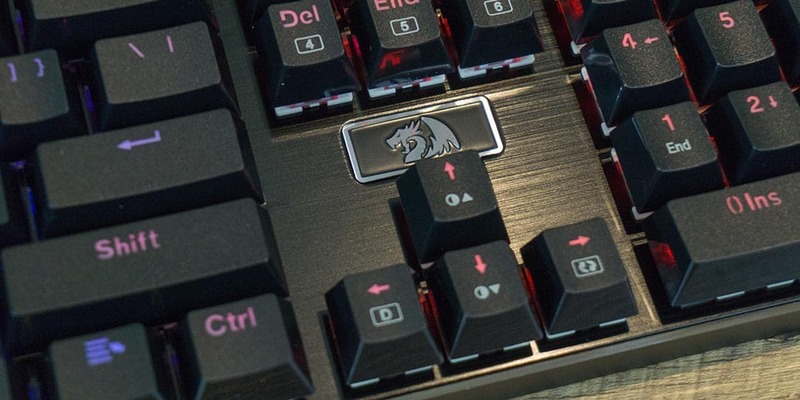 Located above the arrow keys is the Redragon logo in silver, which nicely offsets the chamfered edges. Symbols for numlock, caps lock, and scroll lock are located above the number pad with a red LED light below to indicate when they are toggled on. The top Fn row of keys includes media playback options, as well as shortcuts to common Windows apps like email, calculator, and search. 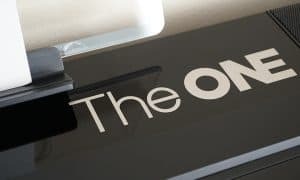 The keycaps themselves are the popular chiclet style with laser engraved letters and numbers. 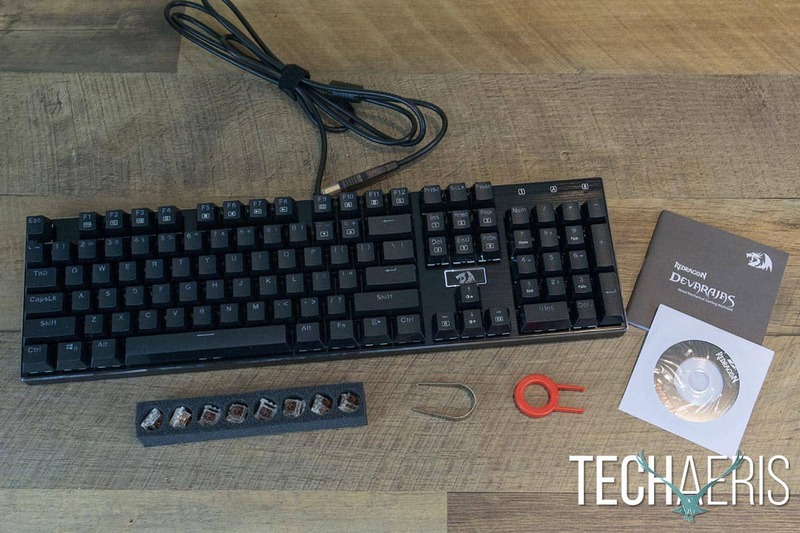 The keys are comfortable when using for extended sessions while gaming or even general office work. Given the raised keycap style, the RGB lighting underneath shines through nicely. 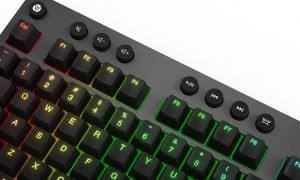 There are a total of 18 different backlit modes plus four specific ones for FPS, MMO, MOBA, and RTS gaming which only light up specific keys. The backlit modes have interesting names like “Go with the stream,” “Swift action,” and “Fast and Furious,” so you kind of have to try them to see which one you like best. This works the same when you want to buy one of the best gaming keyboards in the market. You kind of have to try them so you can evaluate and tell which one you like. 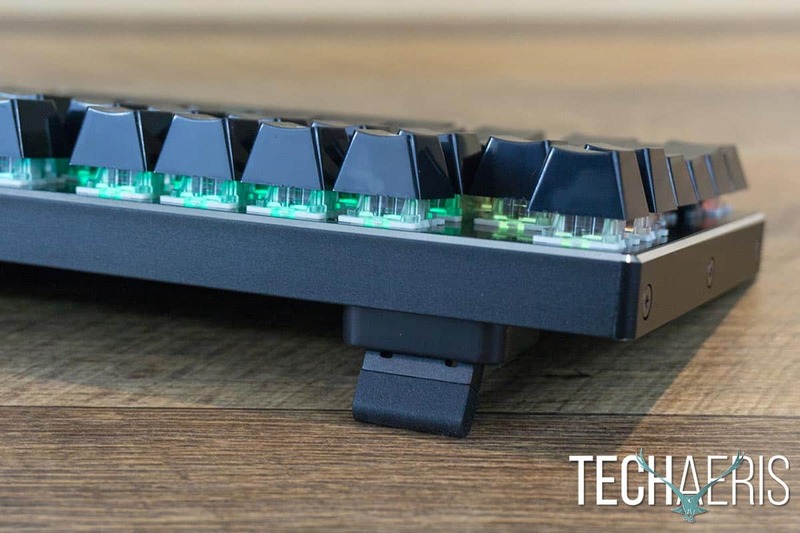 Flipping the keyboard upside down, you’ll find two rubber pads for grip near the front and two adjustable feet at the back. When retracted, they offer a slightly raised back, and while extended — which is my preference — offer a more angled setup. Adjustable feet allow for two angled height settings on the keyboard. As I mentioned earlier, I was pleasantly surprised by the build quality and look of the keyboard. My only complaint as far as the design goes — and this will trickle slightly into Performance section as well — is the lack of dedicated macro buttons. 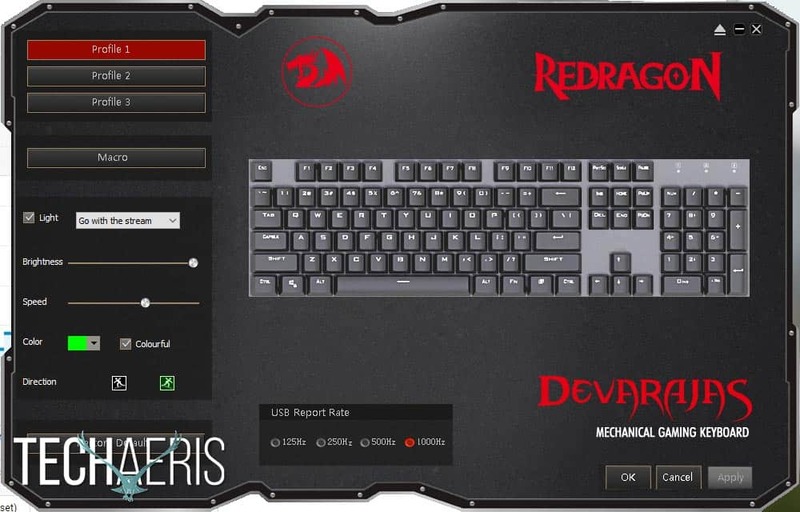 As with most mechanical gaming keyboards, the Redragon K556 can be used out of the box. Simply plug the keyboard into an available USB port on your computer and you’re good to go. You can easily toggle the RGB brightness as well as lighting mode using Fn shortcuts on the keyboard itself. You can also adjust the lighting direction and speed in this manner. When gaming, pressing the Fn + Windows key will lock the Windows key, preventing you from accidentally pressing it while fullscreen gaming and bringing up the Windows menu. As mentioned above, the Fn keys also double as media playback controls when used in conjunction with the Fn keys and allow you to control volume and playback. You can also open your email client, go home, open the calculator, and Windows search using Fn keys. If you want to take advantage of the macro functionality and different profiles, however, you’ll have to install the keyboard software app. Redragon has opted for the odd shaped window design for their software which, while not a big deal, can be extra funky or can drive you crazy in a world of rectangular windows depending on your level of OCD. Design interface aside, the keyboard software is well laid out and very easy to use. The main screen displays the keyboard as well as buttons for three different profiles and to set up macros. The profile you are editing is highlighted in red and once you have finished making your changes simply hit the OK, Cancel, or Apply button in the lower right of the screen. Unfortunately, there is no onboard profile storage but you can import/export settings to easily update a different computer. The main screen of the Redragon K556 software settings app. 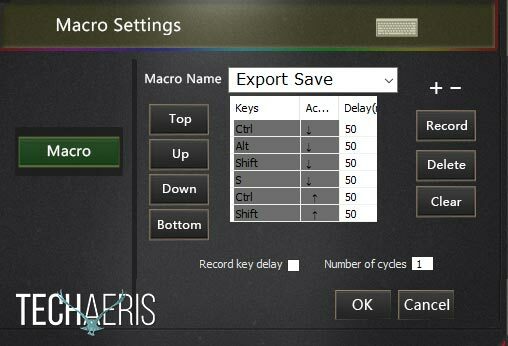 The Macro button is most useful for pre-creating your macros before assigning them to your various keys. The easiest way to assign a macro is to select the key you want to change and then select the Macro button on the Key Settings window that pops up. Here you can select a macro you already created, or assign another key or a media function to that key. Once assigned, press OK or Cancel to return to close the pop-up window. One thing to note, there is a Light checkbox under the Macro button on the main screen. If this is checked, you will not be able to invoke the Key Settings window so be sure to make sure this is turned off. On that note, to change the current RGB lighting settings through the software, check the Light checkbox and select the lighting scheme you want from the dropdown box. After you’ve selected it, you can adjust the brightness, colour, speed, and direction if applicable. If you want to custom configure the colours, your best bet is to select the “Coastal” option then select FPS, MMO, MOBA, or RTS and modify which buttons are lit in which colours you prefer. You can also change the USB Report Rate on the main screen between 125Hz, 250Hz, 500Hz, and 1000Hz via a simple radio button selection. Finally, the up arrow icon in the upper right allows you to import or export settings, access the help PDF, about information, and close the app. 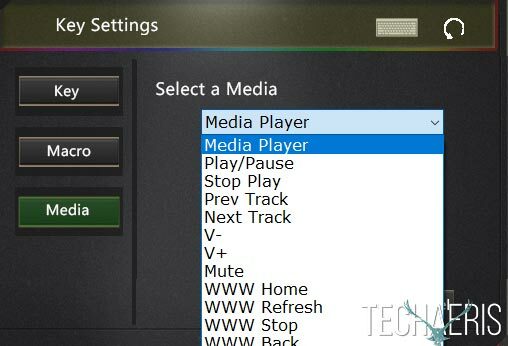 The Key Settings screen showing some of the media controls you can map to a key. While you’ll either like or dislike the interface frame, the keyboard software for the Redragon K556 is really simple and easy to use. The switches used on the Redragon K556 are Outemu Brown switches, of which eight extra switches are included in the box. Brown switches are tactile and, while may seem a bit loud, aren’t as loud as their clicky blue counterparts. I hadn’t heard of the Outemu Browns before but the travel and responsiveness of the keys are as expected — fantastic — and I had no issues with lost keystrokes given the N-key rollover. One issue I did encounter was that on occasion I’d look back up at the screen and see a string of wwwwwwwwwwwwww across the screen. Upon further investigation, the w key was the only one that acted like that — every other key wouldn’t register until the actuation point. Given they included extra switches with the keyboard, I swapped one out and after I did so the issue disappeared. That being said, I’ve been using the K556 five days a week, 6 or 7 hours a day for a couple months and it’s been flawless aside from that. The Outemu Brown mechanical switches work great, are responsive and have a nice actuation point. On that note, swapping out a switch was pretty easy using the included keycap and switch pullers. First, the keycap is removed with the red keycap puller. Next, using the thinner metal switch puller took a bit more force to pull the switch out — it actually went flying across my desk — but swapping in the new one and putting the keycap back on was straightforward. Whether while gaming or daily office use, typing and keystrokes were bang on and, as mentioned before, the keycaps are comfortable enough for all-day use. With an MSRP of $59.99USD, the Redragon K556 Mechanical Gaming Keyboard is a great value for the price, especially if you’re after a keyboard with brown switches, RGB backlighting, and macro functionality. 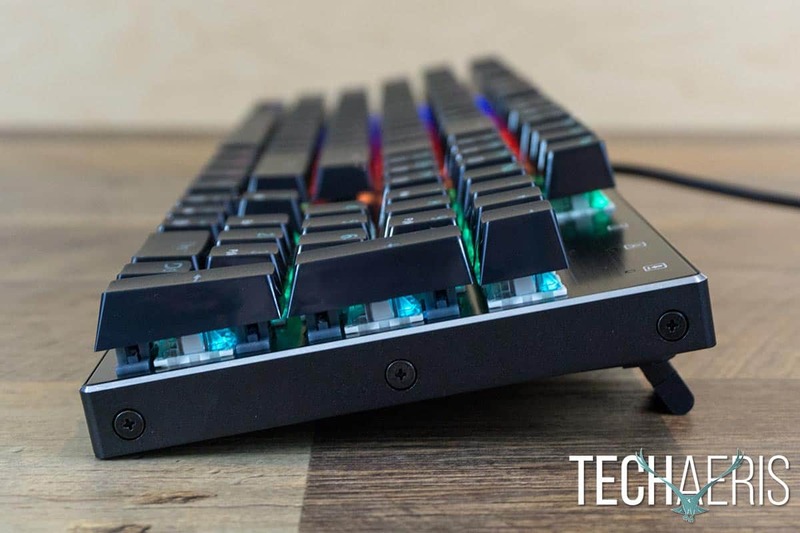 Solid construction, floating key style, RGB lighting, and macro support with profiles offer great value for the price. 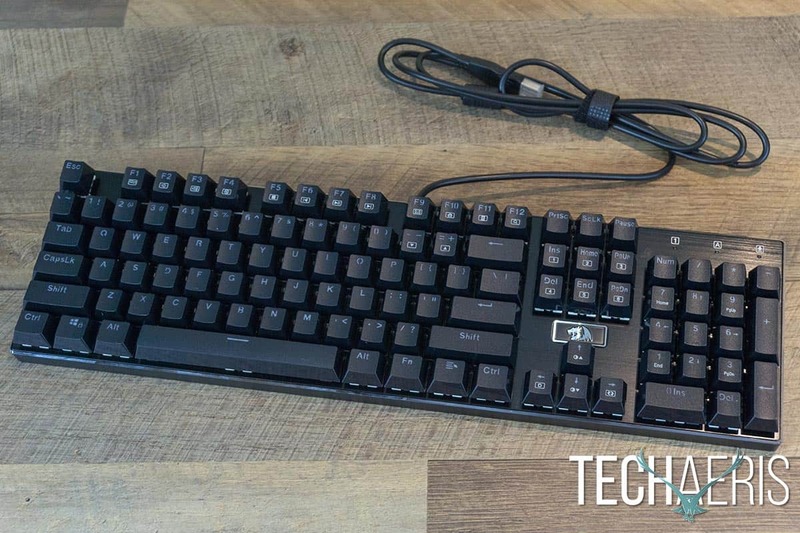 A decent mechanical gaming keyboard can cost upwards of $200USD but there are other options out there. The Redragon K556 is a solid mechanical gaming keyboard with all the gaming necessities and brown switches at a very affordable price. 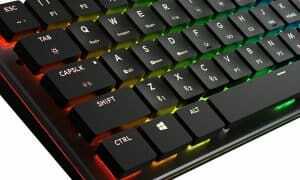 *We were sent a sample of the Redragon K556 RGB Mechanical Gaming Keyboard for the purposes of this review.